Vladimir Rus was born in Rijeka (Flume), Croatia in 1925. He has lived in Croatia, Trieste, Italy and now in Cleveland. He received his extensive education throughout the world. Starting with an Italian Elementary School he went on to study in Croatia and never stopped his education – and educating others. He received a PhD in Political Science – University of Trieste, Ohio Secondary Teaching Certificate (Russian and French), M.A. in Political Science, Western Reserve University, M.A. in Slavic Languages and Literatures, University of Michigan, Candidate in Philosophy, Slavic Languages and Literatures, University of Michigan. 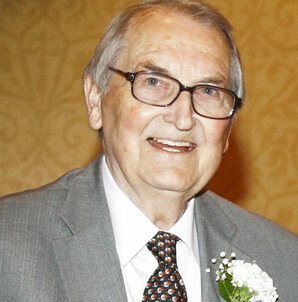 Dr. Rus has taught numerous classes on the historic significance of decisions and activities throughout Eastern Europe, including topics such as “Creation and Dissolution of Yugoslavia (Cuyahoga Community College)” and “Slovenia in the Framework of Yugoslavia” (Cleveland State University), “The Slavic Community of Greater Cleveland” and many more. He also taught “Shoring Up Cleveland” with Mayor Ralph Perk. During his time teaching he taught multiple language courses including Slovenian, Russian and Slavic Languages at CCC, CSU and Western Reserve Universities. He also taught in Trieste, Italy and in the Willoughby-Eastlake High School System. In his capacity as Director of High Technology Resource Development he concentrated on the development of programs to help particularly dislocated workers’ retraining for improved employability and worked very closely with organized labor and apprenticeship programs. He was the Executive Dean of CCC’s Urban Metropolitan Development Institute, which was the institute for positive involvement in the community and economic development problems of the area. Strategic identification of priorities for the best utilization of education and training expertise and capabilities at Cuyahoga Community College in support of the overall economic development of the City of Cleveland and its surrounding area was the primary thrust of UMDI. The focus of activities centered on enhancing the productivity factor of the regional economy through upgrading the area workforce skills level and the education and training of persons entering/re-entering the labor market. He was the Acting Executive Director of the United Labor Agency, as well as their associate director of planning. As such he was In charge of charting the expansion of this agency representing the concern for improved social services of the AFL-CIO, “Teamsters, and the United Auto Workers. While at the United Labor Agency, he planned and conducted several projects. Among them the development and establishment of the Cleveland Area Labor-Management Council as well as some special CETA funded projects of an innovative nature, e.g. the training of unemployed out-of-school youth in building maintenance at the Cleveland Metropolitan Housing Authority estates. Dr. Rus was also the Director of Human Resources and Economic Development for the City of Cleveland. In this capacity he was responsible for Department administration and administration of the Cleveland Area Western Reserve Manpower Consortium (CETA.). In this capacity directed policy development and implementation in areas of economic development and human resources in effort to coordinate labor demand and supply needs in Cleveland area labor market. He was appointed to Governor Voinovich’s Human Resources Investment Council as well as Vice Chair of the Economic Development Committee and member of the Ohio Humanities Council. He is currently doing workshops and classes in various places and working on a Handbook of Ethnocultural Communities.